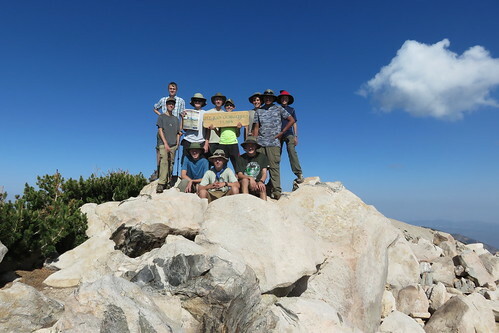 11 scouts made it up on top of San Gorgonio on Saturday, August 30th, 2016. They spent the night up there in their tents or under the open sky. What an achivement! Congratulations!!! San Gorgonio Mountain, is the highest peak in Southern California with 11,503 feet. It was a four day hike with heavy backpacks and a lot of up- and down hill hiking. On the way up the scouts followed the Momyer Creek Trail, and on saw a bear the first day! They tented at predetermined campgrounds, got water from the local creeks and brought plenty of food an snacks (kept in bear canisters). On the way back they followed the Vivian Creek Trail. All in all it was 6000 feet elevation and 24 miles. In Forest Falls everyone enjoyed great Mexican food at a local restaurant. And plenty of water!